The IBM 1402 is the high-speed card reader/punch used with the IBM 1401 computer. It can read 800 cards a minute or punch 250 cards per minute. Most 1401 installations (except the Model D) included a 1402 card reader/punch, so it was a key component of the 1401 system. The 1402 supported high-volume card processing, able to be loaded with 3000 cards at a time. The card reader and punch provided high accuracy by reading each card an additional time to verify the hole counts. It also provided misfeed, jam, and invalid punch detection. The following diagram shows the layout of the 1402. The punch takes cards from the left, they pass through the punches and then the punch check brushes, and go into one of the stacker bins. The reader takes cards from the right, they pass through the two sets of brushes, and are stacked. If the PFR (Punch Feed Read) feature is installed, a second set of brushes is installed in the "blank station" on the left. This allows a card to be read and then punched in a single pass. 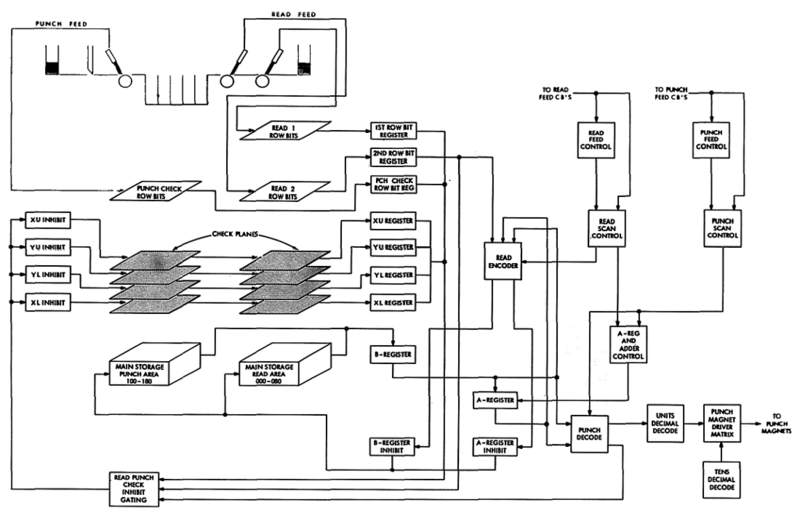 Card feed schematic from Reference Manual. IBM 1401 Data Processing System, page 10. This section outlines some basic principles of the 1402. Cards are read and punched sideways, a row of 80 positions at a time. The read and punch sections are somewhat opposite. The reader moves cards right to left, 9 edge first. The punch moves cards left to right, 12 edge first. The read and punch units are mostly independent: separate motors, separate clutches, separate feed paths, separate brushes, and separate cables to the 1401. The reader runs at 800 cards per minute and the punch runs at 250 cards per minute. These are the key timing numbers that everything depends on. The reader has an 800 RPM drive shaft. Everything is timed off the rotation angle of this drive shaft: 0 to 360 degrees, and one rotation corresponds to one card. The mechanical components are synchronized to this shaft via gears and belts. The electrical timing is synchronized to this shaft via cams that open and close circuit breakers (switches). Likewise, the punch timing is synchronized to the 250 RPM drive shaft. The reader has parts that run whenever the reader motor runs, and parts that run only when a card is being fed. A clutch separates them, and the clutch is triggered for each card. Likewise, the punch has a clutch separating the clutched and unclutched mechanisms, and the clutch is triggered for each card to punch. The 1401 triggers the reading or punching of each card. Once triggered, the complex timing of the read/punch is under control of the 1402. The card processing logic is all in the 1401. The 1401 converts hole patterns to characters and performs error checking. The 1402 has brushes to read holes and punch magnets to punch holes, but does not interpret the cards at all. The 1401 has the punch drivers to drive the punch magnets in the 1402. The thick reader cable between the 1402 and the 1401 includes 160 wires to connect each brush at the two read stations to the 1401. The thick punch cable includes 80 wires for the punch read brushes and 80 wires to drive the punch magnets. Each brush is connected directly to a core in a special plane in the 1401's core memory. The current through each brush directly writes the corresponding core, in parallel, without any addressing. The diagram below shows the reader feed mechanism. Cards pass right-to-left through the mechanism. The feed rolls move the cards, while the contact rolls are used along with the brushes to read the holes. The stack rolls feed cards into the appropriate stacker. Card levers detect the passage of cards through the unit. This indicates when a card can be read and also detects jams. The diagram below shows the punch feed mechanism. Cards pass left-to-right through the mechanism. The stepped feed rolls are eccentric, so they grip the card only during part of the revolution. The intermittent feed rolls are driven by a geneva drive - the card is moved to each of the 12 punch rows and held stationary while being punched. The punch timings are shown in the diagram below. The card is first selected by the picker knife. It is then fed by the stepped roll and then aligned. The intermittent rolls are driven by the geneva drive, which holds the card steady at the 12 punch positions. The stepped roll then feeds the card out of the punch station. The diagram is indexed by "machine time" - the angle from 0 to 360 degrees. (I don't understand how the card enters at 185 degrees, if the clutch engages at 315 degrees.) This diagram is from the 1402 Customer Engineering manual, page 4-5. You might expect that holes are punched in the card by the 80 punch magnets, but the mechanism is a bit more complex. The key components are the punch drive bail, the interposer, and the punch. The interposer pivots so it can be between the punch drive bail and the punch, or pivot out of the way. If the punch magnet is energized, the interposer will pivot between the punch drive bail and the punch. Otherwise, the interposer is not in the path of the punch drive bail. The punch unit has a cam shaft that moves the punch bail down. If the interposer is in the way, the punch bail pushes the interposer into the punch, punching a hole in the card. If the interposer is out of the way, no hole is punched. The benefit of this mechanism is the punch magnets needs to exert very little force, while the hole is punched by the powerful cam action. The punch mechanism is described in detail on page 4-14 of the 1402 Customer Engineering manual. The card punch operates at 250 cards per minute, so its main shaft is driven at 250 rpm, or 240 milliseconds / cycle. The card punch clutch has 4 teeth, so it will take a maximum of 60 milliseconds to engage. These two driveshafts are the key to the timing of the card reader and punch. They take the role that a clock fills in an electronic circuit. One rotation of the shaft corresponds to one mechanical cycle - one card read or punched. Everything is timed relative to the rotation angle of the shaft, from 0 to 360 degrees. The mechanical components are synchronized to the driveshaft since they are connected via gears and belts. The electrical components are synchronized via cams that are driven from these shafts. 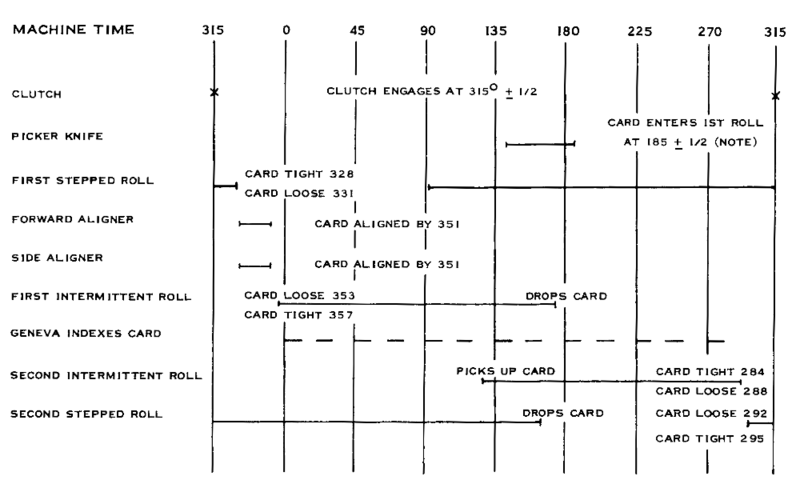 Remember that the card reader and the punch are mostly independent mechanically: there are two separate motors, two separate clutches, two separate timing angles, and so forth. A visual representation of these angles is provided for maintenance. The shafts are connected to "dynamic timers" - one for the reader and one for the punch. A dynamic timer consists of a spinning neon light that is triggered by a selected circuit. The light will illuminate an arc of the circle corresponding to the time its input is active. This visually indicates the angles during which the signal is active. Note that the mechanical drives fall into two sections: unclutched, which run whenever the motor is running; and clutched, which run only when the clutch is engaged. The read cams are driven by the 800 RPM read shaft, so they trigger at the appropriate angle in the read cycle. Each cam is shaped to close and open the circuit breaker at the right time. For some reason I don't understand, the RCCB cams are three-lobed. The PCCB punch cams are driven by the clutched 250 RPM write shaft and close and open circuit breakers at the right angle in the punch cycle. This clutched shaft defines the timing of the punch cycle. The high speed PACB circuit breakers produce a signal for each punch row through slightly complicated timing. They are driven by a shaft rotating at 1333 1/3 RPM, compared to 250 RPM for the regular punch drive. (This shaft is synchronized to the slower punch drive through gears.) Punching each row takes 22.5 degrees (of the 250 RPM punch shaft), or 1/16 of 360 degrees. That gives 12 time intervals to punch and 4 for card movement. During the time the 250 RPM shaft spins 22.5 degrees, the high-speed 1333 1/3 RPM shaft will spin 120 degrees. Thus, 120 degrees of the high speed shaft corresponds to one punch row. The high-speed cams have three lobes separated by 120 degrees so they turn on and off three times in a revolution, once for each row of the card. The solar cell circuit breaker (SCCB) generates a signal as each row of a card passes under the read brushes. It consists of a light-sensisitive semiconductor (the solar cell), a light, and a rotating slotted disk, and is triggered when light shines through a slot. On readers that predate the solar cell, six cams were used in combination to generate the read signals. The control logic inside the 1402 is implemented with relays, rather than transistors. These relays typically have two winding: the "pick" (P) winding activates the relay, and the "hold" (H) winding will hold the relay in the activated state. Each relay has multiple sets of normally-open and normally-closed contacts. See Commutation and control for information on the types of relays used by IBM. Besides the power cables (described below), there are two thick signal cables between the 1401 and the 1402: one for the reader and one for the punch. The reader cable has 80 wires for the read brushes from the first station and 80 wires for the read brushes from the second station. There are also about two dozen control lines. The punch cable has 80 wires for the punch magnets and 80 wires for the punch brushes. There are also about 18 control lines. (See wiring diagram page 29 (31/32)). Each brush is connected directly to a core in memory and sets that core directly. This is an unusual way to write to core - there's no addressing or inhibit lines, just a direct connection from one brush to one core. For a diagram of the row bit core wiring, see page 95 of Field Engineering Maintenance Manual. 1401 Data Processing System. With the PFR feature, there is a second set of brushes in the punch unit, but not an additional set of 80 wires to the 1401, so you might wonder how this works. The #2 read and the punch read share the same set of wires: a set of fourteen 6-position PFR relays switch the 80 wires between the two sets of brushes as needed. The diagram below shows data flow through the 1402 and 1401. The 1402 circuitry is in the upper-left and all the rest is the 1401. Note that the brushes are connected directly to the row bit cores. The XU, YU, XL, and YL planes are used for the hole counting validity checks. The 1401 logic to process cards is described elsewhere, so I won't go into details here. This figure is from the 1402 Consumer Engineering manual page 5-2. One unexpected feature of the 1402 is it provides the power to the 1401 and the rest of the system. The external AC line power is not connected to the 1401, but only to the 1402. The 1402 provides power to the 1401, which then powers all the other peripherals (printer, tape drives, external memory). The 1402 receives three-phase 208 (or 230) volt AC line power, which goes into circuit breakers (i.e. overload-protection breakers), contactors (relays to switch power on and off) and then into power supplies inside the 1402. The power on, power off, and emergency off buttons on the 1401 are actually wired to the 1402, since that's where the power is connected. The 1402 feeds power to the 1401 through two thick power cables. It provides -20V DC, -60V DC, +/- 3V DC marginal check, 115V AC, 130V AC, and three-phase 208V AC to the 1401. It's puzzling that the 1402 provides both 115V AC and 130V AC. The 1401 in turn feeds -12V DC, +30V DC, and +6V DC back to the 1402. Each power cable splits in two at the 1402, so there are 4 power connectors on the 1402: PWA, PWB, PWC, and PWD. The 1401, of course, has additional power supplies. The 1401 Model D system is an exception to all this. Since it doesn't include a card reader, the power supplies are in the 1401 and the 1401 receives AC line power directly. Since several additional gates (01B4, 02A7, 02A8, 02B7, 02B8) are used for power supplies, the Model D does not support multiplication/division. For details on power wiring, see Installation Manual - Physical Planning. IBM 1401 Data Processing System, page 24. Lever to direct cards into the appropriate stacker. Card feed roller driven by geneva gear so the card stops at each punch row position. Mechanical shaker to jog cards into position at input feed or in the stacker. Magnetic or mechanical signal triggered at each punch position. Blades to push a card off the stack and feed it. A semiconductor light sensor to detect each row position. The wiring diagram is somewhat difficult to understand. This section lists some abbreviations and symbols used. Unless you're studying the wiring diagram, you may want to skip this section. Relays are indicated by HDn (heavy duty), DUn (duo), or just n (permissive make). DU contacts are labeled AU, BU, AL, and BL. Under a relay coil symbol is a P (pick) or H (hold). The relay contact symbol is marked with the relay number; the contact symbols may be on different pages than the coils. See wiring diagram page 35 (37-38) for a list of relays and the page sections for each relay. PA, PC, PL, RC, RL: cams (described above). Cams are often marked with the make (M) and break (B) angles. Cams are described on page 22 (23-24) onwards. PWA, PWB, PWC, PWD: the power connections. RC: the 200-pin read connector for the cable to the 1401. (Also reader cam.) PC: the 200-pin punch connector for the cable to the 1401. Switches and lights are listed on page 19 (19-20). SW: switch. BS: brush selection switch. CS: CB selection switch. CT: control transfer switch. DS: display switch. CL: card lever - a switch triggered by the presence of a card. (Also sometimes clutch.) RD: resistor/diode, listed on wiring diagram page 31 (33-34). Thick lines on the schematic indicate wires modified as part of an Engineering Change. Sections of the schematic are indicated as "Section 2A"; these correspond to the numbers at the top of each page and the letters along the left, dividing each page into quadrants. Customer Engineering Service Index. IBM 1402 Reader Punch (Field Engineering manual). Parts Catalog. 1402 Card Read Punch. Customer Engineering Reference Manual. 1402 Card Read-Punch. Wiring Diagram. 1402 Card Read Punch.